Periodontal disease is the #1 cause of tooth loss among adults. Gum disease affects of 75% of adults at some point in their lives and of adults age 65-74, 26% have lost all of their teeth. Chronic periodontitis, the most advanced form of the disease, progresses relatively slowly in most people, and is typically more evident in adulthood. Although inflammation as a result of a bacterial infection is behind all forms of periodontal disease, a variety of factors can influence the severity of the disease. Important risk factors include inherited or genetic susceptibility, smoking, lack of adequate home care, age, diet, health history, and medications. Several research studies have suggested that periodontal disease is connected to variety of other diseases, including heart disease, diabetes, and other systemic diseases. Scientists believe that inflammation may be the basis for the link between these systemic diseases. While periodontists are experts in treating oral inflammation, additional research is needed to better understand how treating periodontal disease may reduce the risk of developing other inflammatory diseases. Dr. Glaser and your hygienists typically rely on a visual assessment of the patient’s overall oral condition, charting pocket depths with a periodontal probe, and their dental health history. This visual/mechanical method of assessing periodontal disease status can only tell whether or not disease is present. There are other tests currently available that go beyond basic and subjective visual assessment to provide dental professionals with the detailed genetic and biological information required to better determine the appropriate treatment regimen for each individual patient. This information includes evaluating the inflammatory burden that is causing periodontal disease, as well as looking at the patient’s unique genetic susceptibility to periodontal disease. The American Academy of Periodontology treatment guidelines stress that periodontal health should be achieved in the least invasive and most cost-effective manner. This is often accomplished through non-surgical treatment. The rationale for three-month maintenance intervals is not arbitrary; it is based on a sound bacterial rationale. Biofilm re-colinization will occur in three to 12 weeks from its disruption. 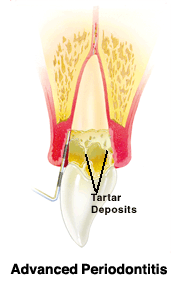 If the patient ignores, or refuses treatment early on, the disease may progress to a point where surgical treatment may be the only option to save the tooth/teeth. That is when a periodontist would play a role in patient care. They surgically cut the gums and clean out the disease. Dr. Glaser will refer you to a periodontist for treatment. Your bone and gum tissue should fit snugly around your teeth like a turtleneck fits around your neck. 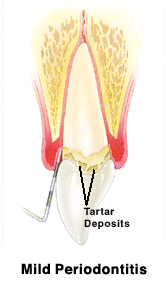 When you have periodontal disease, this supporting tissue and bone is destroyed, forming “pockets” around the teeth. After a deep cleaning to remove most of the bacteria that is damaging your gums, Dr. Glaser may also give you a medicated mouth rinse, like Chlorhexidine, to use at home. Your treatment will depend on the seriousness of your gum disease and how you’ve responed to previous treatments. Dr. Glaser will develop a personalized treatment plan to address your specific case. Get regular cleanings every 3-4 months. This is not an arbitrary timeline but based on bio-film re-colinization will occur in 3-12 weeks from its disruption. This step is imperative to keeping destructive bacteria under control. The bottom line is that the regular and effective removal of dental plaque is the key to achieving and maintaining your oral health! The bottom line – the sooner you take care of your periodontal disease the less it will cost and your results will be better.